Every once in a while, you just wanna lie down in a big pile of garbage and roll around in it. I tend to be struck by this urge more often than most people, so I’m usually watching two or three mindlessly awful shows a season. This fall, my weekly trash heap of choice was Magical Girl Raising Project (aka Mahou Shoujo Ikusei Keikaku, or Mahoiku for short). Mahoiku starts off innocently enough—a featureless concrete arena spotted with the bloody corpses of more than a dozen magical girls, dramatic organs wailing in the background, a single survivor standing amidst the carnage as a large black smoke monster hovers intimidatingly, preparing to attack. The girl handily defeats the monster, and then a smirk crosses her face as petals flutter across the screen. The show wastes no time letting you know exactly what it is—something I admire, particularly in my trash. After the opening theme plays, we’re immediately greeted by a Monokuma-esque creature called Fav as he explains to one of our central characters, Koyuki (aka Snow White), the rules of an in-series smartphone game called… you guessed it: Magical Girl Raising Project. Shortly thereafter, she’s selected to be a real magical girl—something she’s dreamed of since childhood. As Koyuki is introduced to the other magical girls in the area, she discovers her childhood friend, Souta (aka La Pucelle), is among them—a rare male magical girl. And then the episode ends with Fav revealing that, oops, we’ve got too many magical girls, gotta downsize. Under the pretense of a competition to collect “magical candies,” with the loser each week getting cut, a battle royale slowly begins to break out amongst the magical girls—each of whom has their own unique power. It should come as no surprise that, as a huge Danganronpa fan, this exceedingly dumb premise pushes all my buttons. It’s a recipe for three months of endless misery, betrayal, despair and suffering, plotting and scheming, ridiculous twists, and lots, and lots of horrible deaths. In other words, it’s BDH-bait. In the early episodes, while director Hashimoto Hiroyuki (Gochiusa) and series composer Yoshioka Takao (everything from Elfen Lied to Working!!! to Kimiuso) still have some flexibility with the source material, the show even appears to have something resembling a heart. The first to fall, Nemurin, is a victim of her own lethargy—she chooses to operate only within others’ dreams, but the candy she collects there doesn’t count in the real world—and, of course, Fav conveniently omitting the part where getting cut means dying. But Nemurin is shown effecting positive change on those whose dreams she visits, even unknowingly serving as a source of inspiration for another magical girl, Swim Swim. Nemurin’s character is given a surprising degree of respect before she’s unceremoniously killed off. Upon discovering the actual stakes of the game, the girls begin to resort to more drastic measures—beginning with a plot to steal candy from Snow White, the consistent top scorer. This transforms into a coup against the attacking faction’s leader, Ruler, by none other than Swim Swim, spurred to action by Nemurin’s encouragement. Ruler dies, and Swim Swim takes over, becoming the princess she so admired. It’s a twisted turn on what had been a sweet moment, and perhaps the show at its darkly cleverest—a detail original to the adaptation, at that, as Nemurin just… dies off-screen in the book, and that’s the end of that. Things escalate from there. With the death/murder of La Pucelle at the hands of Cranberry, the girls learn that as long as someone dies each week, the magical candy rankings don’t matter. So the pretense drops and they start going after each other. It’s around this point that the brilliantly named Hardgore Alice is introduced, who has the power to regenerate from any amount of physical damage—so long as she’s in magical girl form. This leads to a gloriously absurd montage of the short-fused Calamity Mary doing everything in her power to take out Alice in revenge for killing her partner, Magicaloid 44, a magical girl robot. The murder attempts conclude with Mary setting Alice on fire, sealing the glowing remains in a barrel, filling it with concrete, and throwing it into ocean. It’s a ridiculous sequence, and perhaps one of my favorites in the entire series, if just for the sheer excessiveness of it all. At this point, it’s all-out war, and the staff are no longer able to effectively dampen the source material’s miserably cruel edge. 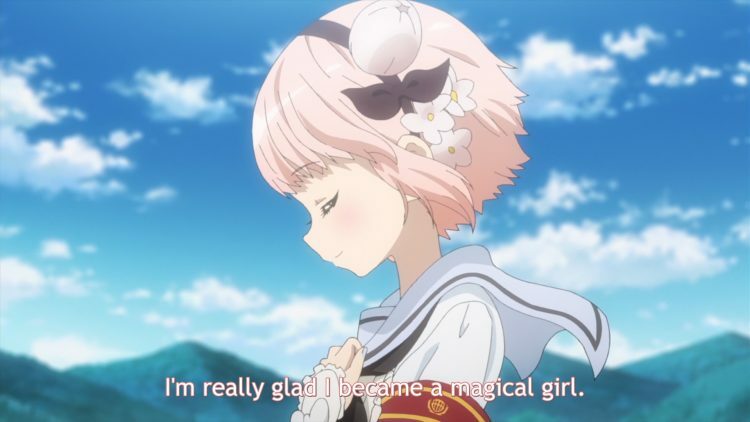 In short order, we get to see a kindhearted magical girl nun commit suicide following the death of her girlfriend, who she spent months working to help become a magical girl; the casual reveal that one of the characters was a pregnant mother after Swim Swim stabbed her through the stomach, killing both her and her unborn child; and one of Swim Swim’s lackeys infiltrating Hardgore Alice’s home, revealing her location so they could kill her (a middle-school girl) in broad daylight without giving her the chance to transform. It’s about as bottom-of-the-barrel shock schlock as you can get. The antagonists’ motivations, when we finally learn them, are comically shallow as well—Cranberry just wants to fight strong opponents, and Fav is… bored? of following protocol? so he sets up a death game? instead of the wholesome, nobody-dies competition it’s supposed to be? But it’s okay because Swim Swim, an elementary-school girl who wants to be a princess, manages to explode Cranberry with the help of dog-costumed Tama, who she then summarily executes for seeing her human form. And in a masterful turn on the show’s “flashback three minutes before they die” pattern, we’re treated to Tama’s heart-wrenching flashback as a geyser of blood spews from the gash in her neck. In the weeks leading up to Mahoiku’s finale, I ran through countless different theories about what the show’s inevitable mind-blowing twist was going to be: Was this all in a virtual realm, a game within a game? Was there some greater evil pulling the strings that they would have to overcome? Was it a scheme to train up magical girls for a war against some unknown, external threat? But rather than any of that, the show gave me the best twist of all: there was no twist. It really was just a senseless, cruel murder game set up by a bored Monokuma creature where the main character survived by virtue of being the main character, and literally nothing else. Magical Girl Raising Project was a garbage fire to its very core, and I loved every second of it. This post barely scratches the surface of exactly how stupid and awful and miserable and nonsensical the show is, so if you haven’t watched it already and find yourself in the mood for some mindless trash, give it a swing.